Extract the zip file into your Objectdock, Docklet Directory. I love this and was trying to get this in my dock...but when i put it in the docklet diretory i doesnt show up? Your new master volume venom works great so i know i'm doing something wrong Please help? I'm a HUGE fan of Venom and your new stuff is just awesome!! Make sure there is a folder called Weather within your Docklet folder. If not, create one. Then, unzip into that folder. If there is a Weather folder already there, then I would suggest making a copy of the existing icon folder, then copy the "Venom" icons into the original folder overwriting the images within it. 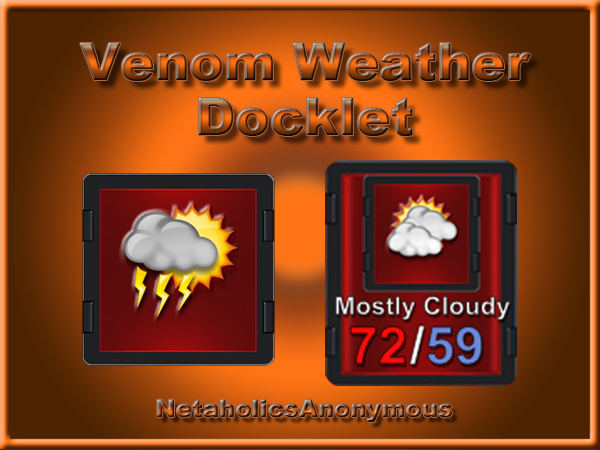 You should also make a copy of the original backdrop.png and rename it, then move the "Venom" backdrop.png into the weather folder. You should probably unload OD then reload it if the new weather docklet does not show up in the Add > Docklets list. I get it on my Dock but it doesnt updateand says Weather Information is Unavaiable. What Port is this going through?